My half bathroom was white, builder bland and boring. I wanted to do something old timey to honor the porcelain pieces that my Grandmother painted and a place put some old family photographs but with a bit of a modern twist because I'm not completely an old fashioned girl. The trapeze mirror, shelf, toilet paper holder, and towel ring are all Umbra that I got on sale and each a different store. It’s like the universe wanted this bathroom design to come together! 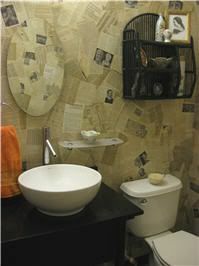 The inspiration for the wallpaper came from a stack of books I was going to donate to charity. I flipped through the yellowed pages of a paperback reference book and thought it would be a great wall color. Being that the book was out of date, I doubted it would actually sell at the bookstore and thought, "Hey, why don't I use it as wallpaper instead?" I went to the thrift store to get more books to use as wallpaper. I didn't want a story, just random interesting pages. 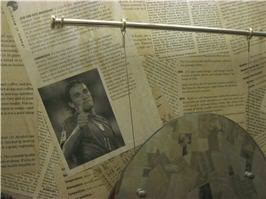 I used watered down white glue as a DIY Modge Podge to paste the book pages to the wall. I used a combination of orphaned encyclopedia volume, a New York city travel guide, 2 almanacs (one from the year we were married, the other from the year we bought the house), a Portuguese soccer book, and a movie listings book, among others. After pasting the pages to the walls, I tea stained them with old tea bags and coffee grounds to age the pages from the newer books. A coat of clear glaze protects everything from moisture. It cost a grand total of $20 to do the walls because I had a gallon of white glue and glaze left over from another project. The shelving is a wicker shelf from my old house painted black. The wall switches are the original white ones that came with the house and repainted black as well as the base boards. I got a deal on the paint because the can was dented and the put it on clearance. There are CFLs in the new light fixture I installed. Husband admired a similar one in another store so when this little beauty was on sale at HomeGoods I snatched it up and installed it. I replaced the boring builder's sink and vanity with a vessel sink and black granite topped vanity. I did all of the work myself - this was my first plumbing project ever! I use a porcelain bowl my Grandmother painted as a soap dish. It holds a bar of homemade soap I bought at a craft show. All of my cleaning supplies are discretely tucked away in a trunk that held TV promotion information for a syndicated TV show. I got it when I worked in the promotion department of a local television station. Method featured my bathroom on their blog and said “Lisa's a 2010 gal with a 1950’s soul.” I suppose it’s true. How did they know I’m pining for the next season of Mad Men to start? This is an entry for PartSelect’s $5000 GE Giveaway contest. Um, WOW! I love it...! So cool. Well done!! Hey dear just a heads up I'll need our help with my downstairs walls doing some patching this summer! Mmmmm... How you spose to read and do your business at the same time... I would keep having to stop and go and read the wall. Did you do the ceiling as well? My My ..you are really getting the experience! Good Job! Impressive. Love love love it. I will probably never get anything done in the bathroom. I'll just keep on reading and reading and reading. WOW!! What a fun idea! I love it! I never would have thought of doing something like this! How very clever! That is a beautiful bathroom. I absolutely love it. I love the "wallpaper", the vessel sink, the colors, everything. I might have to copy. LOL. Thank you for visiting junkblossoms. Blessings, Pat. When I read "books as wallpaper," I thought it might have a very vintage vibe... but this is so modern. I love it! I LOVE this look and I can't wait until I'm in a more permanent home so I can do this! I've seen this done before. Love the vintage feel. How is it holding up? You have such a unique idea!..bravo! 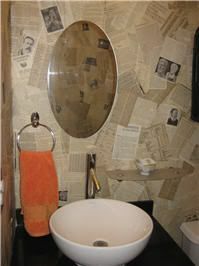 Hey this is awesome idea about bathroom remodel with newspapers. I am appreciating of this idea. That's so amazing and creative! I love how it all came together. Great job! Bwahahahaha! "Even when I'm having a bad day I get a thumbs up in the mirror." Awesome. Your redo rocks! Did you seal the pages with a clear sealer? I sealed the pages with clear glaze. It's the same type of glaze you use for decorative paint treatments.